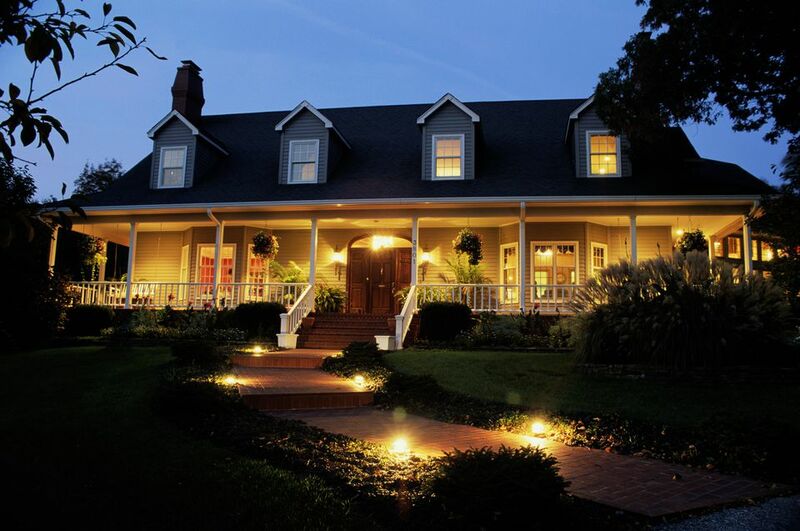 Landscape path lights are not just about providing a safe walkway to your home or security for the exterior. Pathway lights can paint your property with a pleasing mixture of glowing, warm spots of light that highlight or define the walkway or garden areas. Less Light Failure: Your lights will run as long as you want. They are not dependent on a battery charge supplied by a stamp-sized solar panel. Expansion Allowed: When you have a low voltage cable running through your yard, you can change out old light fixtures for new ones. You can even add new fixtures, as long as your transformer is correctly sized for the increased power draw. Line voltage light groups are a bit more difficult to expand, but it can be done. Extra Features: Many wired systems have photo sensors on the transformers that turn the lights on or off in response to ambient light. Most systems have clock timers that allow you to turn the lights off at bedtime, for instance. Low voltage wired lights will never be as easy to install as solar lights, but they come close. As long as you have an outdoor GFCI outlet located within about 10 to 15 feet of your first light location, the rest of the installation is a matter of laying cable and clipping in lights. Should you buy low voltage or line voltage walkway lights? The names sound similar and are easily confused, yet they are vastly different. Line voltage path lights use thick cable; must be buried 18 inches underground; must be run through conduits; and need weather-tight junction boxes. While line voltage lights are perfectly fine and in many ways are preferable to low voltage lights, they are not well suited for the average do-it-yourselfer. Transformer: The transformer is a heavy, weather-tight box that plugs into your outdoor GFCI outlet. On the back of the transformer is a terminal for attaching the cable. Cable: About the thickness of a lamp cord, this 50 foot to 75 foot dark-colored cable runs through your property. It begins at the transformer and finishes at the very end point of the light run. While the cable can be run on the ground, it is better to bury it just below the earth or landscape bark. Lights: Lights attach at any point along the cable with a "push-pierce" type of connector or are manually hard-wired in. Path light kits are a good way to begin lighting your path and yard, though quality may be lacking with some kit products. Instead of creating your pathway light system from scratch, piece by piece, you may wish to purchase a unified kit. Low voltage path light kits come with a transformer, cable, and between four to eight pathway lights. Less expensive entry-level pathway kits are often lacking in quality. Consider a quality kit of about six lights that comes with a transformer, all-metal light fixtures, and hard wiring into the cable, as opposed to using less reliable push-pierce connectors. Elements of lower quality path lights include: all plastic light construction; faulty connectors; and potentially defective transformers. Still, if creating a path light system from scratch is a stumbling block for you, you can do worse than purchasing an economy-level path lighting kit. If you would like to purchase the parts individually, just make sure that you keep the three major components in mind: transformer, cable, and lights. Since kit systems already have the correctly sized transformer, in order to do this piecemeal you will need to calculate the correct transformer needed for your light group. The transformer's wattage rating dictates how many and which kinds of lights you can plug into the system. Whether you buy a path lighting kit or assemble it from scratch, the heart of that system is the transformer. Once you have a transformer, you can add more lights, change their positions, and even incorporate lights of a different brand, as long as they are electrically compatible. First, add up the watts of each fixture, then come up with their total combined power draw. According to the National Electric Code (NEC), since a circuit can only be loaded to an 80 percent maximum, you can effectively call this a 120 watt transformer. Because of current loss through the cable, you may wish to bring this number down another 10 percent, leaving you with a transformer that is good for 108 watts. Now, subtract your total fixture power draw from your transformer. The 108 watt transformer minus the 82 watt tier fixture draw leaves 26 watts available for extra fixtures. So, in this common scenario, you could add one more flood light or three more tier lights. For more effective and permanent lighting, purchase wired path lights that plug into an outdoor outlet, not solar lights. Solar path lights have their place, providing minimal light when you need it quickly, like for a backyard party or for surprise guests who are unfamiliar with your property. Low Light: Take a cue from the fact that solar light kits often come in large quantities of ten or fifteen lights. The feeble light that they cast is more about defining the outlines of a pathway or patio than providing any actual light. Small Solar Panels: The larger the solar panel, the more light it can collect. Yet the larger the panel, the more top-heavy it becomes. Not only that, large solar panels paired with similarly sized (or smaller) lights can look ungainly and awkward. Short Lighting Cycles: Solar lights collect the least amount of energy at the time of year when you most need it. During short winter days, solar lights store less energy and thus the lights shine for a shorter period of time. On top of this, due to shorter days, the lights turn on earlier. Help! My Dog's Pee is Killing My Landscaping!